» Why You'll LOVE Our New Look! 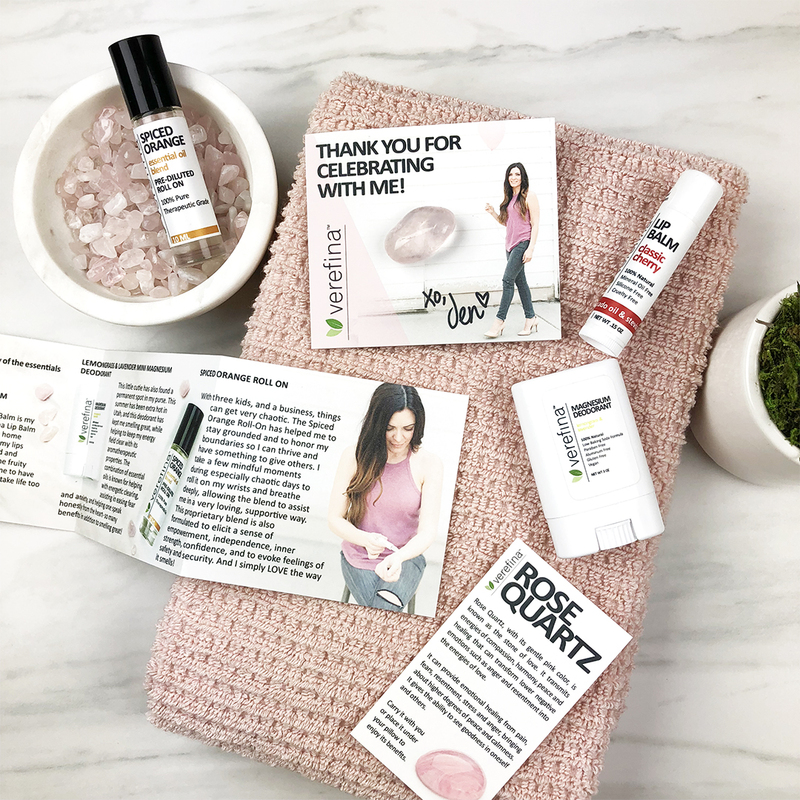 This special gift is valued at $22 and includes some of Jen's favorite products — Classic Cherry Lip Balm, Lemongrass & Lavender Mini Magnesium Deodorant, and Spiced Orange Roll On. This gift also contains a Rose Quartz Crystal with accompanying information card. All of these items come in a canvas drawstring bag with a beautifully designed booklet explaining the benefits of each product for you. "Our Classic Cherry Lip Balm is my favorite of the Verefina Lip Balm flavors; I never leave home without it. It keeps my lips feeling moisturized and nourished, and the fruity flavor reminds me to have fun and not to take life too seriously! The Lemongrass & Lavender Mini Magnesium Deodorant has also found a permanent spot in my purse. This summer has been extra hot in Utah, and this deodorant has kept me smelling great, while helping to keep my energy field clear with its aromatherapeutic properties. The combination of essential oils is known for helping with energetic clearing, assisting in easing fear and anxiety, and helping one speak honestly from the heart- so many benefits in addition to smelling great! With three kids, and a business, things can get very chaotic. The Spiced Orange Roll On has helped me to stay grounded and to honor my boundaries so I can thrive and have something to give others. I take a few mindful moments during especially chaotic days to roll it on my wrists and breathe deeply, allowing the blend to assist me in a very loving, supportive way. This proprietary blend is also formulated to elicit a sense of empowerment, independence, inner strength, confidence, and to evoke feelings of safety and security. And I simply LOVE the way it smells! Lastly, the use of crystals and gemstones with their unique energies is a part of my holistic lifestyle — helping me to live my best life. Rose quartz keeps my heart chakra open, allowing me to flow unconditional love to myself and others. It creates a softness around my energy field, allowing me to connect deeply with those around me. That feeling of love-for-all, is one of the best feelings ever! When I’m in the space of love, I feel I can accomplish anything! I also sleep with a huge chunk of rose quartz by my bedside each night. I’m in love with rose quartz! I hope you will enjoy these small gifts and use them with intention. They truly come from my heart! Thank you again for celebrating my 39th birthday with me! I honor you and your life, no matter what year you are in your journey!" We hope you'll enjoy this gift of the heart from Jen to you! *Free U.S. shipping is usually only available on orders of $75 or more. **Free shipping applies to orders of $39 or more, before tax, and in the U.S. only. Free gift applies to orders of $79 or more, before tax, and after any applicable discounts. Promotion does not apply to wholesale orders. Why You'll LOVE Our New Look! Induce Joy and Uplift the Heart and Mind with Peppermint Joy!